The weather has been a bit windy, but it is good to get outside. Well, outside in a way that doesn't involve lawn work. 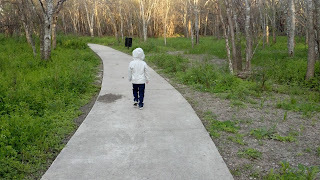 There is a small park near our house that is perfect for a quick walk, with various stops to look at spider webs and rolly-polys. I've become more of an explorer since my son came along. It's kind of fun to explore the parts of the world that are very small and hidden from us by inattention. During the week everything seems to pass by in a blur, so it is good to let things slow down at least one day a week. haha, I correct typos in comments too. Love the picture. Was really windy here too. I love when I can take the time to enjoy something simple. My kids always liked to play with rolypolys. I love how Zane inspires adventures!